Page 2 – Seeker of all things nourishing; kindness, good food, innovation, humor and good intention. Most people celebrate the New Year on January 1st or according to the Chinese Lunar calendar in January or February each year. The New Year is a perfect time to set intentions, try new things and to make new commitments to be our best selves. I also celebrate the New Year, but for me the real New Year begins in late August when the kids go back to school. Back to school marks the end of unscheduled days and late bedtimes, and the beginning of routine and rigor. My annual family photo albums begin each year not in January, but with the first day of school and end with our adventurous travel and lazy days of summer photos. Each year as the kids go back to school we all have an opportunity to try new things, commit to new routines and to set goals. The kids choose new activities and their busy schedules enable me to explore new interests too. I sign up for volunteer positions, revamp my exercise, take on consulting jobs, meet new people and have more energy to engage in projects I have been putting off all year. While the unscheduled summer months hold their charm and the pace of the school year is exhausting and complaint-worthy, most parents secretly yearn for the sanity of routine and schedule, and with good reason. Research shows that children thrive within the comfortable boundaries of familiar routines, clear expectations and sensible limits. Child development experts unfailingly advocate the importance of routine for children. Routine is the foundation of elementary school. At home, children thrive with well-established morning and bedtime rituals. “Bath, brush, books, bed” is a popular, healthy evening routine in households with any age children. This gives everyone something to look forward to and sets a clear expectation of when it’s time to turn off the lights and go to sleep. Routine is also important for adults. A fascinating 2011 New York Times article by John Tierney described the phenomenon of decision fatigue, claiming that humans have a finite capacity for decision making each day, and that this capacity is depleted every time a decision is made, no matter its relative importance. For example, the article suggests that the time of day a judge hears a case is a more important indicator of the likelihood of parole for an inmate than are the circumstances of the case. Judges are much more risk averse right before lunch and late in the day than in the morning or immediately following a lunch break. Making decisions can be exhausting. The more decisions one makes, the harder each one becomes. After awhile, decision makers can become reckless or reluctant to make any decisions at all. In a series of fascinating studies, researchers demonstrated that making choices eventually undermines willpower and resolve too. Stanford University psychologist Dr. Kelly McGonigal has written extensively on the topic of willpower. Her bestselling book The Willpower Instinct provides great guidance for those looking to change habits and set more positive routines. The Power of Habit by Charles Duhigg is another useful book that describes the science behind the formation of habits and the importance of cultivating positive ones. Decision fatigue is a real phenomenon that can be mitigated by a solid routine, and, interestingly, by a boost of glucose. Instead of waking up each morning trying to decide if you should go for a hike or a run, sleep in or eat breakfast, automating those decisions frees up precious space for more important decisions later in the day. Annie Dillard reminds us that, “How we spend our days is, of course, how we spend our lives.” With consistent day-to-day routines, we have more space to make constructive big decisions and the willpower to stick to those resolutions, whenever we begin. Financial literacy is as important to teach our children as is any other kind of literacy, and yet many of us shy away from candid conversations about money with our children. In so doing, we miss an opportunity to instill family values and to cultivate positive traits like generosity, patience and perseverance. When I lived in Santa Monica ten years ago and had young children, I was pleased to see many teenagers in my neighborhood who could babysit. Talking to their parents, however, I was told that they were too busy and they didn’t need the money. I was astounded. Babysitting was my route to financial autonomy when I was in High School. I babysat for a dozen different families who paid me about a dollar an hour. I saved my money and thought through my purchases carefully, always hesitant to part with that hard earned cash. Wanting to impart the same lessons to my own children, I attempted to introduce an elaborate plan to teach my first born about money. I gave him three dollars each week allowance and insisted that he put one of each in three separate envelopes labeled “spend,” “save,” and “donate.” The problem was, he wanted a toy that cost $30. At that rate it would take him so long to save enough to buy the toy, he would have lost interest (an important lesson in itself, but not the one I was trying to teach). At that age, was waiting five months really teaching him anything about financial management? I soon abandoned my allowance plan. Ten years later many wonderful resources exist to guide parents through allowance strategies that are more successful because they are both practical guides and they help parents initiate conversations about underlying values associated with stewarding wealth. In this broader values-based conversation that incorporates lessons about gratitude, generosity and responsibility, raising financially aware children is easier and more meaningful. Raising Financially Fit Kids by Joline Godfrey and Money Doesn’t Grow on Trees by Neale S. Godfrey are two more excellent books that walk parents through the process of raising financially literate children. The website www.jumpstart.org is a practical resource offered by a coalition of diverse financial education stakeholders working together to educate and prepare youth for life-long financial success. It’s never too early to begin to introduce the concepts of wealth stewardship to children. Children’s picture books can be a terrific way to initiate discussions about money management and generosity. The Penny Pot by Stuart J. Murphy focuses on using math in everyday life and comes with oversized coins to help them do so. Lemonade in Winter by Emily Jenkins is a great read aloud picture book about entrepreneurship and the costs of doing business. For teens and adults, the 1926 classic by George S. Clason, The Richest Man in Babylon uses ancient parables to discuss wealth management and might be a good option for both parents and teenagers to read to begin a deeper, more philosophical discussion about affluence and values. Conscious stewardship of wealth is as important a skill to impart to children as are manners and kindness. A local Hong Kong philanthropist explained that his motivation comes from witnessing his father’s own generosity and from Confucian teachings to take care of one’s family. Christian values also encourage generosity and restraint in the accumulation and dissemination of wealth. Whatever the source, teaching children that money should be spent wisely, given generously, and shepherded carefully will help inculcate valuable life skills and positive character traits. Sometimes the benefits can accrue directly to the parents. For example, I love my dog, but I really dislike is the early morning dog walk. This summer my youngest son and I came to an agreement. If he would do the morning dog walk, he would be paid $10/week. For him it is a source of pride, gets him up and out for a good long brisk walk around the neighborhood, teaches him responsibility and has awakened a new understanding. He has started to consider purchases in terms of what percentage of his weekly earnings something costs. When he realized that buying a trinket at the market cost over half of his weekly earnings, he quickly stopped pestering me about it. 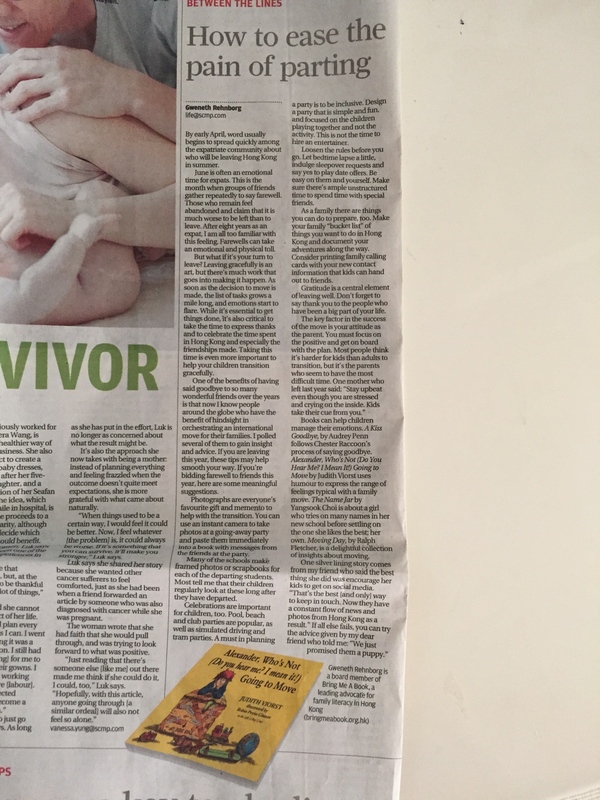 I’m not sure why the titled it “Take a leaf out of book groups” in the paper, as that makes no sense to me, but here’s the latest musing anyway… (a link, and full submitted text below, as usual). Over the summer every student, administrator and teacher at my son’s High School will read Boy Snow Bird by Helen Oyeyemi. Carefully selected I suspect for the timely themes of race and identity, this book will ignite conversations and spark debates around the campus. Curious, I decided to read the book too, and it prompted me to consider further the value of a common literature reading experience among a large group of people. I have had the pleasure of being a member of an active book group in Hong Kong. We take turns hosting, providing a simple meal over which we earnestly discuss the book without a moderator or prescribed set of questions. Like many expatriate communities, the composition of our book group has changed over the years – currently more members of our original book group live in New York City than in Hong Kong – but we have always replenished with perceptive and literate women who love books. Beyond the social aspect, the value of this group has been the broadening of mind and perspective that occurs as the result of reading books I never would have chosen myself, or didn’t even particularly enjoy after reading. When members share personal history, cultural references and academic expertise relevant to the book, my understanding and my appreciation for the book is always enhanced. When children’s author Deborah Wiles visited Hong Kong the entire HKIS Upper Primary read one of her books to build enthusiasm in preparation for her visit. Children were able to discuss the book, gained confidence meeting the author and shared the experience with their peers. Unlike didactic work in which a book is assigned and taught by an instructor, this type of common literary experience is voluntary, undirected and intended for fun. Parent/child book clubs are another way of connecting, bonding and sometimes broaching difficult or embarrassing topics through literature. Difficult circumstances faced by characters in a novel provide distance and hypothetical scenarios that are useful in initiating tricky discussions with children. These conversations offer insights from both parents and peers that can translate into real life lessons. Sometimes common reading experiences expand beyond the personal network to larger communities. The One City One Book program started in Seattle in 1998 and has been embraced in some form or another by hundreds of cities around the world. The Library of Congress keeps a running list of these programs in the U.S., and the National Endowment for the Arts funds similar programs under the title The Big Read in some cities. Oftentimes initiated and managed by public libraries, these programs encourage all community members and visitors to read a carefully selected title, and many host creative events to encourage discussion, bring the community together and enhance the reader’s understanding of the book and the underlying themes therein. Selecting a single book that is both noteworthy, but does not offend or endorse any one group or ideal over any other is the most difficult element of implementing this kind of program. The United Nations Educational Scientific and Cultural Organization (UNESCO) has designated eleven cities around the world as Cities of Literature. These cities embrace a rigorous process to demonstrate a unique and fervent appreciation and support for the creation, consumption, critique and celebration of all aspects of literature. Achieving this designation from UNESCO is an arduous process and a considerable honor. Bookstores are closing all over Hong Kong and less than half of our city’s adult population admits to reading for pleasure. The benefits of reading for pleasure have been widely reported, but like getting enough sleep, eating healthy foods, daily exercise and abstaining from harmful behavior, the advice is rarely heeded. Modeling reading is important for building young readers. 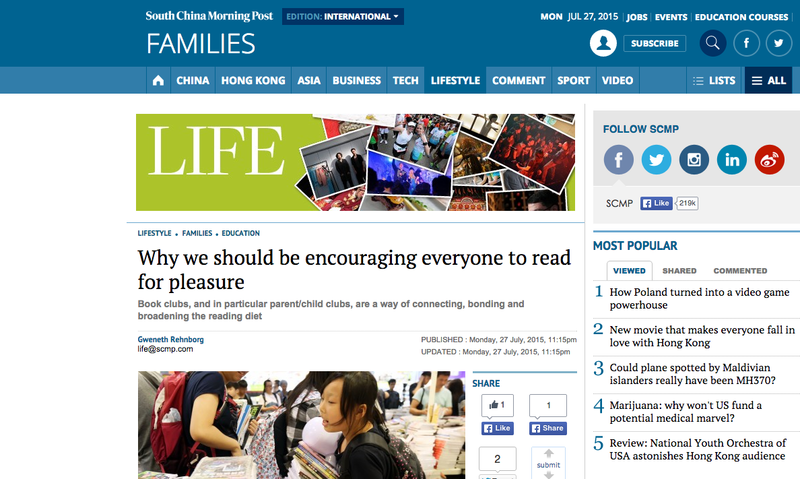 Hong Kong might consider striving to be the next UNESCO City of Literature to encourage reading for pleasure and to set a good example for the younger generation. Driving the entire perimeter of Hong Kong Island takes less than an hour with no traffic. I sometimes think of HK Island as a clock with Central at noon, Stanley at 5, Pokfulam at 8 and so on. Going out in Hong Kong can be lots of fun, but deciding where to go can be a challenge. Many of the restaurants in HK are mediocre and expensive, and not really that much fun. 1. Wanchai East – Start at Stone Nullah Tavern for a drink in the fun London-style neighborhood pub, then walk across Queens Road East and down a block toward the wet market to Serge et le Phoque for an unbelievable “can’t make this at home” tasting menu. Plywood tables, french blue banquettes and a long horizontal mirror strategically placed to capture the red signs from the Wanchai wet market outside create the perfect paired down chic interior, coupled with the cute French waiters and earnest sommelier; it’s a great night out. Best with one other couple or a few girlfriends. 2. Causeway Bay – I must admit I didn’t spend a lot of time eating in Causeway Bay. I understand that it’s a food mecca, with fantastic places tucked high above the hustle and bustle, but I never really tapped into the scene. I had a great meal at Town, but I never really discovered much else because the pull of our absolute favorite family meal, Din Tai Fung was just too strong. Despite it now being a global chain from Taiwan, everyone loves the xiao long bao and beautiful greens. The more the merrier, but get there when it opens or plan to wait awhile for a table. 3. Taikoo Shing/Quarry Bay – Years ago my friend Cindy introduced me to the greatest pottery studio and private kitchen called Gitone in a housing estate in Quarry Bay. This is a total gem of a place with a delicious tasting menu for dinner or simple, healthy noodle soup and vegetable lunch in an oasis of calm and beauty as soon as you walk through the doors. Take your book group for a pottery/dinner, host a private party, or just grab a few couples and have a quiet delicious meal in the capable hands of the husband/wife artist owners who will make sure everything is perfect (I even hosted a 12-year-old pottery birthday party there and the kids seemed to love it!). Top off your night with a drink at Sugar, a rooftop bar on the top of East with stunning views of Hong Kong. 4. Stanley – The best food in this seaside town is tucked in a windowless room in the middle of Stanley Market. Lucy’s has been serving delicious, innovative food to the south side for decades. Don’t go to dish, as you will know everyone when you walk in. Relative newcomer Stan’s Cafe has a beautiful view, the best baguette, cheese and sausage available southside, and a strong, if expensive, French menu. With the kiddos, skip the sketchy Softee truck and instead hit The Cave (below Paisano’s Pizza) for Pinkberry-worthy frozen yogurt. 5. Repulse Bay – Despite the recent opening of The Pulse, RB is still a culinary straggler. Spices is an old-time favorite, good for a birthday lunch with a pan-Asian menu, and tea at The Verandah, run by The Peninsula Hotel, gives you the same experience without the trek to TST, but neither is spectacular. I didn’t find a restaurant I really liked at the Pulse, despite several attempts. Limewood has a great look and location and is really good at private parties, but I’m not a huge fan of the regular restaurant. Not sure why their food is much better when the party is private, but after 2 parties and six attempts at lunch/dinner, that was my experience. 6. Aberdeen/Wong Chuk Hang – My current favorite food in HK is located on the 22nd floor of the Yally Industrial Building. The sketchy lift from the cargo loading dock opens out to an industrial chic, order at the counter, soup/salad & thinnest crust pizza ever made by earnest 20-somethings at 3/3rds. With free wifi, generous light, couches and mis-matched tables, this is a place to go with friends, or on your own with a book to hang out for awhile. I love this place! 7. Kennedy Town – This is old school, but if you want to feel a million miles away from the HK scene, Bistronomique is a classic French place with a great look and a tucked away location on a small gentrified street. It’s industrial and refined. Reviews online are mixed, but we had a noteworthy meal and a wonderful night there, so I have only good things to say about it. A great date night spot. 8. Sai Ying Pun – Ping Pong Gintoneria is clever and great style, but you have to get there early, as last call is at 10 even on a Friday night. When I’m feeling really wholesome, I’ll go for an organic, vegetarian meal at Grassroots Pantry, but trekking to SYP for healthy food on a weekend night is a stretch. A good mid-week bet, or girlfriend lunch, especially if you have something to do at HKU, or combine it with Ping Pong and have a little devil/angel night. 9.Sheung Wan – Dozens of restaurants have come and gone in the time it’s taken Yardbird to settle in as a HK fixture. No reservations and a line every night, swing by Yardbird and put your name on the list. They’ll give you a buzzer and call you in an hour or so when you can finally get a table at this delicious yakatori style chicken place that never disappoints. Head to Aberdeen Street Social at the PMQ for a cocktail first. Ronin (Japanese) and Cocotte (French) are two other perfect date night spots off Gough Street in the same neighborhood. We recently hosted a party at Cocotte and the sweet and earnest manager made our party just what we had hoped. He has just opened a nightclub across the staircase from Cocotte, so you can make a night of it. 10. Central Classic- While they go without saying, how can a HK restaurant list not include Sevva (the Dosa! ), Mott 32 (the Iberico Char Siu!) and the China Club (the Peking Duck!)? It seems cliche even to mention them, but they truly are excellent. Service, food, decor are impeccable at all three. For discerning out of town guests, these places are a must. 11. Central New – Start at On Dining on the 29th floor of 18 On Lan Street. Giancarlo Mancino will make sure your drink is the best you’ve ever tasted from his signature Negroni with his own Mancino vermouth to the margarita made with bergamot and Himalayan pink salt shaved over top. I hear the cheese plate is great too. Or, if you want upscale delicious, NUR by chef Topham Nurudin is the best. Another fun night out in Central includes Chom Chom, Chi Cha and Chachawan. I just like saying that! Chom Chom in Soho has the best Vietnamese street food (no reservations, but hang out on the precipitous landing outside until you get a table). Chachawan has great cocktails and the flank steak salad is delicious and Chi Cha just fits with the other two. 12. Wanchai – Burgers are the name of the game in the Star Street neighborhood. 22 Ships, Beef and Liberty, The Butcher Club, The Pawn all compete for your attention for the best burger. While I love a burger the much as anyone, for a truly special Chinese meal, try Michelin starred Guo Fu Lou tucked away in the basement of the Empire Hotel. It could be because I had a culinary genius and dear friend order for our group, but this was one of the finest dining experiences I had my whole time in HK. Homework is so inextricably linked to school that it’s hard to think of one without the other. But increasingly educators and child development specialists are examining the practice of assigning homework to children and considering whether it is truly beneficial or potentially harmful. A growing trend to abandon homework altogether for children is building momentum around the world. The Guardian reported this week that one of Britain’s most prestigious schools, 162-year-old Cheltenham Ladies College, is considering banning homework to “tackle an epidemic of teenage depression and anxiety.” Public School 116 in New York City recently banned homework for students up to grade five having found no link between assigning elementary school homework and success in school. The Kino School in Arizona has a no homework policy for all grades even through high school, and contends that learning remains joyful for their students. Even some of New York City’s most prestigious private schools like Dalton and Spence have reviewed their policies to lessen the nightly burden on their students. The primary arguments against homework are that it reinforces a sedentary lifestyle, leads to frustration, exhaustion and stress for children, gives them little time to do other constructive things, can lessen children’s genuine interest in learning, burdens teachers to design and grade homework and parents who have to monitor and often spend time doing homework instead of more engaging activities with their children and that it is pointless, since there is no evidence that it leads to improved performance later in school. Parents like homework because they believe that it reinforcing learning at home, reveals what children are learning in school, establishes good routines and habits, and it helps shape the afternoon hours after school for the families. While these points seem reasonable, most of the benefits are accrued by the parent rather than the student, and the actual effect is not what parents think. Good communication between teachers and parents can show parents what children are learning without requiring the child to do busywork at home. In fact, busy work can overwhelm struggling students and bore high achievers, dampening their interest in learning. Parents reason that homework should help, but no study shows that it actually does. In our busy and frenetic society, the primary benefit of homework may be simply that it keeps children engaged in seemly constructive activities after school and reduces our own anxiety that they might not be learning enough in school. In certain subjects, like Chinese, an argument could be made that practice and wrote memorization is the only way to do it, but the optimal quantity and quality of assignments beyond the classroom even in these subjects is unclear. Perhaps the homework debate is not so much a yes or no, but what kind? Annie Murphy Paul described in a 2001 NY Times article the concepts of spaced repetition, retrieval practice, and interleaving as three research-based strategies that demonstrate positive results when applied to homework. More research into these specific techniques and others like them could influence schools to more consciously design interesting and engaging extension activities that truly benefit students’ learning. Reading for pleasure is the one area of “home work” that educators and researchers agree is essential for children on a daily basis. This practice has the biggest impact on future success in school. Children should be encouraged to select their own books and should not fill out reading logs or be rewarded for reading except, perhaps, with more books. Developing an intrinsic love for reading is the most essential determinant of future happiness and success in school. In lieu of homework, creative projects can be helpful in reinforcing concepts, extending learning and engaging children and parents in the learning process. Working collaboratively, teachers, students and parents can identify after school activities that are active, creative and fun for kids, and a much better use of everyone’s time. Heading into summer holidays, many parents look forward to more unstructured time with their children, time to stay up late and not have to rush home to do homework. What if parents could look forward to that time throughout the school year as well, knowing that in this case, less really is more. It helps to have friends with some of the coolest jobs in the world. Karen and I have been friends for fifteen years, since our first children were born and we figured out parenting together with our beloved mommy group in Los Angeles. Now she’s in North Carolina and I’m in Hong Kong, but we keep in touch and still compare parenting notes on everything from the allowable length of shorts to young adult fiction, teen dating and whatever else comes up. What bibliophile among us has not at one time or another proclaimed, “I wish I could get paid to read books!” For award-winning professional audiobook narrator Karen White, this childhood dream came true. Expecting her first child sixteen years ago, White parlayed her classical acting training into a career that fits perfectly around family life, providing her flexibility, recognition, independence, a professional community and yes, she gets paid to read books. 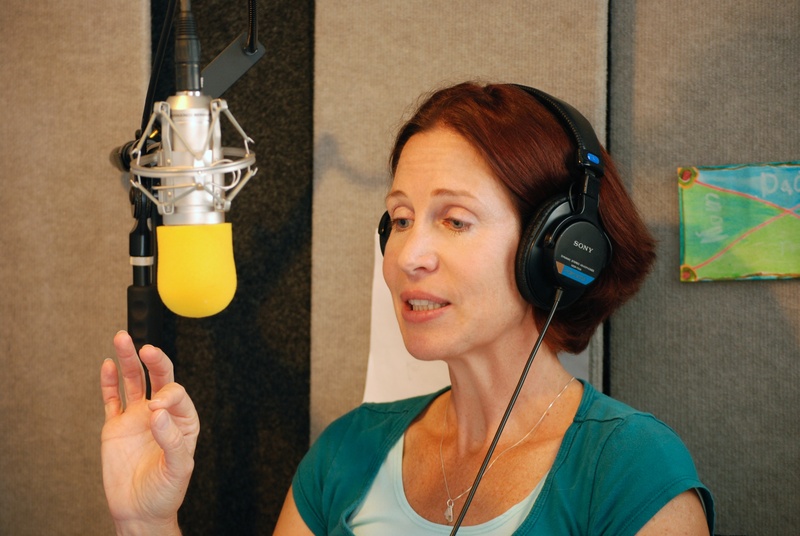 White is part of a select group of industry-represented professional audio book narrators. With more than 200 books recorded, she credits training in classical theatre, her foundational experience working with directors in studios, and her voice training as key components of her success. Professionally recorded audiobooks require incredible stamina, rigorous practice and years of experience to be able to understand, absorb and produce a book with consistency and believability. “Changes in technology have made it possible for me to work entirely from home. When I started recording audiobooks, I had to go to a studio and work with an engineer and director. Now, I have a built-in studio in my house and the newer software allows me to edit as I go with a click of the keyboard. High internet speeds mean that I can upload large files directly to the production companies. It’s not easy work, but I love it, and it allows me to have a career as a performer and still be there when my kids get home from school.” White said. The audiobook business is gaining an increasingly impressive foothold in the traditional book industry as technology makes production of and access to audiobooks easy. With better recording and distribution tools, both self-publishing and self-recorded audiobooks are on the rise. And this provides a wonderful resource for busy families with continual access to technology and a proclivity to multitask. While the feel of a paper book in the hand by the beach is unique, audiobooks offer some practical advantages in certain circumstances, especially during the summer. They are portable and can provide much needed entertainment for the inevitable delays in summer travel. Those long car rides and crowded MTR commutes with kids are made instantly painless by a great story, and provide a rich common topic to discuss at meals. I like to listen to audiobooks while my son is at his sports lessons. Listening to a story instead of reading it myself enables me to keep an eye on the ball and appear like I’m riveted, but to occupy my mind in a more active way at the same time. Several resources exist to access high quality audiobooks. First, be sure you are downloading from a reputable site and that you select an unabridged version. Sometimes the author reads his or her own book, but professional audio book readers bring characters to life in an exciting and subtle way that can add a richness to a story that makes for an enhanced experience. To find great audiobooks, many turn to industry publications like AudioFile Magazine, or to successful audio book bloggers like Audiobook Jukebox, Literate Housewife, Guilded Earlobe, AudioGals to name a few. The website Goodreads is a treasure trove of information about books and also has an “audiobooks” section that offers everything from book recommendations to technical advice. A paid subscription to Amazon’s audible.com is the gold standard of audiobooks, but at a subscription rate of $14.00 USD per month, it is expensive. They do offer a subscription-free service, but do not advertise it. Audible also offers Whispersync technology, which enables one to bundle the audiobook with the purchase of a kindle book relatively cheaply. Whispersync then allows you to go back and forth from e-book to audiobook effortlessly. Downpour.com is a reliable alternative if you don’t want to pay a large subscription fee. A few terrific audiobook programs are geared specifically to young readers. Subscription-based Tales2Go has over 1,700 titles available for children, and allows up to five devices, so the whole family can use one subscription. Audio File currently has an incentive program called SYNC designed specifically for young adult audio book listeners. It gives away two complete audiobook downloads weekly, including a current Young Adult title paired thematically with a Classic or required summer reading title, to listeners ages 13+ during the summer session. Not all of the titles are available for download outside of the US, but many are. Several websites offer free downloads of varying quality, but one resource stands out above all, and that is OverDrive.com, which gives access to library collections around the world via a downloadable app. Check with your school librarian to learn how to access the service. And for those who use a CD player, most libraries have large collections of CD copies of audiobooks to borrow. June is audiobook month, so be sure to check the websites listed for promotions and events near you. Tuition for many international schools was due at the end of March, so by early April, word began to spread quickly among the expatriate community about who will be leaving Hong Kong this summer. The emotional perils of June for expats is well documented. This is the month when groups of friends gather repeatedly to say farewell. Those who remain feel abandoned and claim that it is much worse to be left than to leave. After eight years as an expat, I am all too familiar with this feeling. I bid adieu to upwards of twenty families every June. These were people who touched our lives, to whom we felt close connections and with whom we shared meaningful experiences. Farewells can take an emotional and sometimes even a physical toll. But what if it’s your turn to leave this year? Leaving gracefully is an art, but there’s a whole lot of work that goes into making it happen. As soon as the decision to move is made the list of tasks grows a mile long, and emotions start to flare. While it’s essential to get things done, it’s also critical to take the time to express gratitude and to celebrate the time spent in Hong Kong and especially the friendships you’ve made along the way. Taking this time is even more important to help your children transition gracefully. One of the benefits of having said goodbye to so many wonderful friends over the years is that now I know people around the globe who have the benefit of hindsight having successfully orchestrated an international move for their families. I recently polled several of them to gain insight and advice. If you are leaving, these tips may help smooth your way. If your bidding farewell to friends this year, here are some suggestions that will be truly meaningful. Photographs of all sorts are by far everyone’s favorite gift and memento to help with the transition. Take lots of photos! One friend recommended using a Polaroid instant camera to take photos at a going away party and paste them immediately into a book with messages from the friends at the party. Many of the schools make framed photos or picture scrapbooks for each of the departing kids. Most tell me that their kids regularly look at these long after they have settled in their new home. My teenager still has a collage hanging in his room that was made for him by his friend when we left London six years ago. Celebrations are important for children too. Pool, beach and club parties are popular, as well as more elaborate foot massages, simulated driving, and tram parties. A must in planning a party is to be inclusive. Design a party that is simple and fun, and focused on the children playing together and not the activity. This is not the time to hire an entertainer or organize a craft. Loosen the rules before you go. Let bedtime lapse a little, indulge the sleepover requests and always say yes to the play date offer. Be easy on them and yourself. Make sure there’s ample unstructured time to spend time with special friends, especially as the departure date nears. As a family there are things you can do to prepare too. Make your family “bucket list” of things you want to do in Hong Kong and document your adventures along the way. Consider printing family calling cards with your new contact information that kids can hand out to friends. List the great things about Hong Kong and the new place. Gratitude is a central element of leaving well. Don’t forget to say thank you to the people who have been a big part of your life. Try to think ahead, because when it gets busy toward the end, expressing gratitude is the first thing to go. The key factor in the success of the move, however, is not the parties or memory books, but your attitude as the parent. You must focus on the positive, especially if one spouse is less excited, and get on board with the plan. While few good resources seem to exist to help children transition “home” or to a new country, here are a few to consider. For the youngest children, A Kiss Goodbye, by Audrey Penn follows Chester Raccoon’s process of saying goodbye. Alexander, Who is Not (Do You Hear Me? I Mean It!) Going to Move by Judith Viorst uses humor and hyperbole to express the range of feelings that are typical with a family move. The Name Jar by Yangsook Choi is about a girl who tries on many names in her new school before settling on the one she likes the best; her own. Moving Day, by Ralph Fletcher, is a delightful collection of insights about moving for all ages.